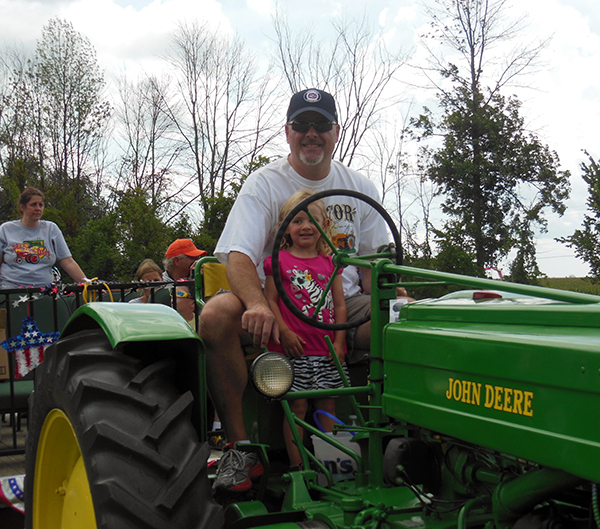 Munger's 61st annual Potato Festival was more than just spuds and suds. This is an event that has something for everyone and judging on the huge crowds, it was enjoyed by everyone. The highlight of the festival beyond the many ways to enjoy potatoes was the races and parade. The tractors line up to begin the parade. Munger showed off their small town with huge hospitality. As expected, they featured many ways to enjoy great potatoes and I for one can personally vouch for the excellent potato soup. What makes these local festivals so much fun is the attendance by your friends and neighbors. We ran into Dr. Robert Hafford, a local family doctor icon and his wife outside the food hall. It was his strong enthusiastic recommendation of the soup and he was spot on. Trinity St. James Lutheran Church handled the food tent offering for the first time a Friday Perch Fish Fry along with other great goodies like their double meat steak sandwiches and brats and a Sunday chicken dinner. Various bands filled the evening beer tents with lively and good music. And let's not forget the free potatoes given away at the end of the night. One of the best attractions was the Figure Eight and Demolition Derby held each night. The stands surrounding the arena was jammed with people as they enjoyed cheered on their favorite drivers and car was secretly anticipating the crashes that were inevitable. All in all the races were a ton of fun and well organized to keep the action going as they cleared the arena for the next racers. Figure 8 racing is more about skill and strategy than speed. Sometimes it is hard to tell who is coming and going. Demolition Derby is one event we all secretly want to do just once. The winner is the one that is still running, even though he is full of smoke. And what is a festival without a queen and parade. This year's is Paige Lupcke. Local businesses, organizations and bands showed their creativity with special floats and displays to the delight of the well attended route. This is a true community event as extended families and friends gathered at the homes and business along M- 138 while the children practiced their Halloween skills gathering up candy tossed along the route. Color guard leads off the parade. You got to love the 1938 DeSoto. I know I do. Floats make the parade unique. The Munger Potato Festival, like so many of our other local festivals brings community and families together for a weekend of fun and fellowship. There is always something for everyone. John Keuvelaar is a college student at Midwest Photography Workshops and Delta College.